MailUp S.p.A. (the “Company” or the “Issuer” or “MailUp”), a company admitted to trading on the multilateral trading facility AIM Italia / Alternative Investment Market and operating in the marketing technology field, following the press releases respectively issued on September 19 and October 30, 2018, has announced today that the formal requirements for the final closing of Datatrics B.V.’s (“Datatrics”) acquisition were completed. 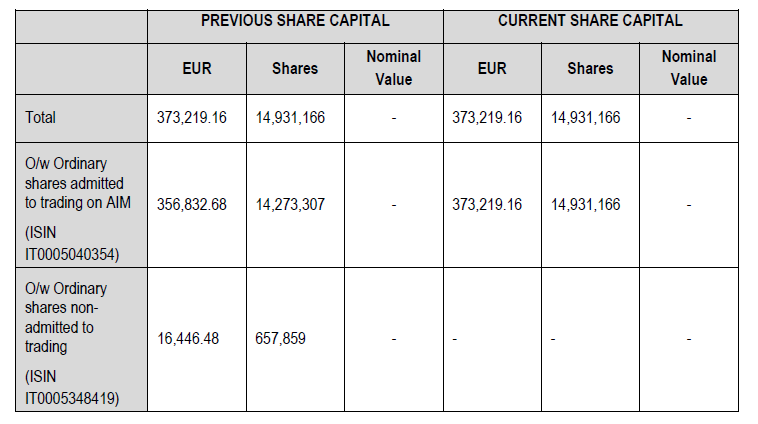 In detail, with respect to the capital increase amounting to Euro 1,557,810.11 (share premium included) passed by the Board of Directors on October 30, 2018 and paid via the contribution in kind of n. 409 Datatrics shares, representing 40.94% of its share capital (the “Capital Increase in Kind”), the Issuer’s Board of Directors carried out the relevant activities according to art. 2443-quater of Italian Codice Civile. (e) the requirement for the professional capabilities and independence of the expert is met according to the applicable law. According to art. 2343-quater, fourth paragraph, of Italian Codice Civile, since the Board of Directors resolution was registered in the Companies Register on December 13, 2018, n. 657.859 MailUp’s ordinary shares, no nominal value, regular rights, deriving from the Capital Increase have been released and assigned to the relevant owners with the same ISIN as MailUp’s circulating ordinary shares. Today the declaration according to art. 2444 of Italian Codice Civile of full liberation of the Capital Increase in Kind has been registered in Milan’s Company Register.